That model number is ‘SM-G888N0’ and this isn’t the first time it’s appeared, as it’s also recently been spotted in a filing from the Korean National Radio Research Agency (NRRA), and at the Bluetooth Special Interest Group. But this is the first time it’s been posted by Samsung itself, and all this activity, coupled with the fact that it has its own support page, albeit a currently empty one, suggests the phone could be launching very soon. The bigger question is whether this is actually the Samsung Galaxy X, as the model number only seems to be linked to Samsung’s foldable phone on the basis that it’s not related to any existing range. 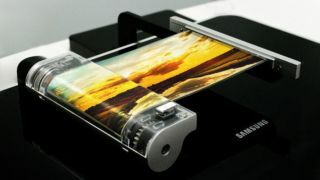 So it may well be a more conventional handset, but Samsung doesn’t often launch new ranges of phones, and there is other evidence that we might see the Galaxy X soon, most notably a comment from Samsung’s mobile boss, who said the company aims to launch a folding phone in 2018. In which case it’s possible that the phone will be launched at CES 2018 in January, in order to keep it out the way of the Samsung Galaxy S9, which is likely to land a couple of months later. But if the SM-G888N0 really is the Samsung Galaxy X we wouldn’t count on being able to buy it even when it does launch, as the ‘N0’ in the name suggests the phone is headed to South Korea, and that may well be the only place it launches, as Samsung probably won’t want to commit to a global launch for such an untested idea.